Yo, ho, ho and a bottle of rum! Ahoy there me mateys! It’s me again, yer favorite app pirate ready to go on another booty hunting adventure with the crew and me parrot pet. Did ye know that aside from me parrot, we also had a fox at the good old Jolly Roger. The sad part is we lost it in one of our treasure hunts. ‘Tis why this app called Fast Like a Fox by WayBefore Ltd. immediately got me attention as it made me remember our lost fox. This is the game that we have for review today. Batten down the hatches and let’s begin. The graphics of the game is old school as it used vector and geometrical shapes instead of the usual 2D or 3D graphics that most apps have today. However, that is not a deal breaker because it works for the game. It still looks pleasant, especially that the background looks polished. There are also changes in it like it turns into valleys that are covered by snows, red caves with fires, etc. The terrain changes so there’s something new to see. While the gameplay is the same throughout the game, you will see different things so you would not get easily bored. This game uses unique controls in playing. 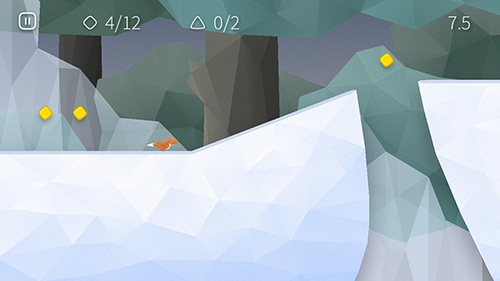 While jumping is the usual control, which is tapping on the screen, the control to make the fox jump is different. You need to tap at the back of your phone to make it run. However, this may not work on all phones as you might find difficulties doing this on phones with thicker cases. Moreover, you may also need to change the position of your phone to make it work. The terrain can be challenging, which is good as it will keep you on edge and it makes you want to overcome those that you failed to pass. The good news is that you can always retry if you failed to pass the level. There are areas where you need to be very careful as you could easily fall and there are also those unexpected obstacles that you will only learn as you pass them. So expect to have to repeat some levels a few times before you can move to the next one. 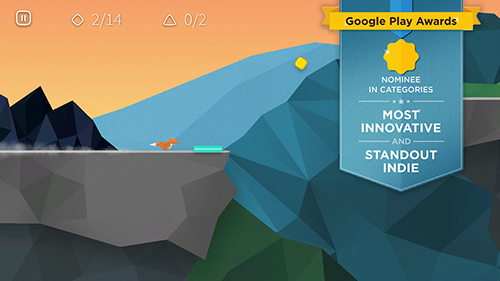 Fast Like a Fox is free to play and it is challenging. For those who want to feel on edge and want to feel challenged, this app is a good find. It also has changing terrains and backgrounds. The unique control for making the fox run can be a drawback to some people especially for those who have thick housing on their phones because it may not work. The direction of the phone may also need to be adjusted in order for the controls to respond properly. Aside from the possible control issues that you may encounter, Fast Like a Fox is a great game to add on your list. It’s challenging, free to play, and it has changing environment and terrains.